Investigators conducting pioneering histological evaluations of rheumatoid arthritis (RA) patient synovial tissue were struck by the gross similarities between hyperplastic synovium and solid tumors found in cancer patients, especially in regard to the “tumor-like proliferation” of stromal fibroblast-like synoviocytes (FLS) localized to the synovial intimal lining layer [1 Fassbender HG. Histomorphological basis of articular cartilage destruction in rheumatoid arthritis Coll Relat Res 1983; 3: 141-55., 2 Fassbender HG. What destroys the joint in rheumatoid arthritis? Arch Orthop Trauma Surg 1998; 117: 2-7.]. Subsequent in vitro analyses of isolated RA FLS further extended the conceptual association of synovial hyperplasia with oncogenic transformation, as FLS displayed many of the phenotypic characteristics inexorably linked to cancer cells. RA FLS display enhanced proliferative capacity compared to FLS obtained from healthy tissue or patients with other forms of arthritis, the cells can proliferate in an anchorage-independent manner in vitro without inhibition by cell-cell contact, and constitutively secrete autocrines and matrix metalloproteinases (MMPs), supporting proliferation and tissue invasion [3 Mohr W, Beneke G, Mohing W. Proliferation of synovial lining cells and fibroblasts Ann Rheum Dis 1975; 34: 219-4.-5 Trabandt A, Aicher WK, Gay RE, et al. Expression of the collagenolytic and Ras-induced cysteine proteinase cathepsin L and proliferation-associated oncogenes in synovial cells of MRL/I mice and patients with rheumatoid arthritis Matrix 1990; 10: 349-61.]. In a poignant extension of these similarities, elegant studies have demonstrated that activated RA FLS can migrate from collagen implants in mice to unaffected joints and initiate inflammation and cartilage destruction at distal locations, a phenomenon markedly analogous to tumor cell metastasis in cancer [6 Lefevre S, Knedla A, Tennie C, et al. Synovial fibroblasts spread rheumatoid arthritis to unaffected joints Nat Med 2009; 15: 1414-20.]. These intrinsic properties of RA FLS are not transient responses to inflammatory stimuli. Instead, it is clear that this phenotype is imprinted upon RA FLS, as gene expression profiles of RA patient synovial tissue and FLS cultured ex vivo from the same patients are highly similar [7 Kasperkovitz PV, Timmer TC, Smeets TJ, et al. Fibroblast-like synoviocytes derived from patients with rheumatoid arthritis show the imprint of synovial tissue heterogeneity: evidence of a link between an increased myofibroblast-like phenotype and high-inflammation synovitis Arthritis Rheum 2005; 52: 430-1.]. This imprinted phenotype has important functional consequences, as the invasive properties of RA FLS in vitro highly correlate with the rate of joint destruction occurring in the patients from which they were obtained [8 Tolboom TC, Pieterman E, van der Laan WH, et al. Invasive properties of fibroblast-like synoviocytes: correlation with growth characteristics and expression of MMP-1, MMP-3, and MMP-10 Ann Rheum Dis 2002; 61: 975-80., 9 Tolboom TC, van der Helm-Van Mil AH, Nelissen RG, Breedveld FC, Toes RE, Huizinga TW. Invasiveness of fibroblast-like synoviocytes is an individual patient characteristic associated with the rate of joint destruction in patients with rheumatoid arthritis Arthritis Rheum 2005; 52: 1999-2002.]. The molecular mechanisms contributing to this “semi-transformed” phenotype of RA FLS are still poorly understood. One of the possibilities initially explored was that early inflammatory events in the synovium might generate somatic mutations in proto-oncogenes or tumor suppressors, altering FLS behavior [10 Gay S, Gay RE. Cellular basis and oncogene expression of rheumatoid joint destruction Rheumatol Int 1989; 9: 105-3.]. These first studies understandably focused on genes at the forefront of cancer biology, but attempts to identify somatic mutations in primary candidates such as ras genes or the tumor suppressors phosphatase and tensin deleted on chromosome 10 (PTEN) or p53 were either unsuccessful or failed to support a general and supporting role for such mutations in conferring an imprinted aggressive phenotype to RA FLS [11 Firestein GS, Echeverri F, Yeo M, Zvaifler NJ, Green DR. Somatic mutations in the p53 tumor suppressor gene in rheumatoid arthritis synovium Proc Natl Acad Sci USA 1997; 94: 10895-900.-16 Tak PP, Smeets TJ, Boyle DL, et al. 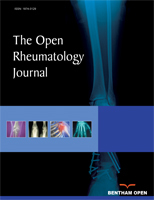 p53 overexpression in synovial tissue from patients with early and longstanding rheumatoid arthritis compared with patients with reactive arthritis and osteoarthritis Arthritis Rheum 1999; 42: 948-53.]. Thus, while a simple molecular mechanism responsible for the “semi-transformed” phenotype of RA FLS continues to elude us, studies addressing this question have promoted a rapid increase in the identification and understanding of intracellular signal transduction pathways, persistently activated by constant exposure of synovial cells to a complex inflammatory cytokine and cell-cell milieu, that are important to pathology in RA and other chronic inflammatory diseases [17 Tas SW, Remans PH, Reedquist KA, Tak PP. Signal transduction pathways and transcription factors as therapeutic targets in inflammatory disease: towards innovative antirheumatic therapy Curr Pharm Des 2005; 11: 581-611.]. Not surprisingly, many of these intracellular signaling pathways are critically regulated by the same proto-oncogene and tumor suppressor gene products important in cellular transformation. In this review, we will examine recent advances in our understanding of how members of the Ras superfamily of GTPases contribute to immune-mediated inflammatory diseases, and highlight evolving opportunities for targeting these signaling proteins therapeutically. The Ras superfamily of small GTPases constitutes a group of more than 100 structurally related proteins which regulate a large spectrum of cellular processes, ranging from acute responses to extracellular stimuli, to roles commonly described as “housekeeping functions” [18 Takai Y, Sasaki T, Matozaki T. Small GTP-binding proteins Physiol Rev 2001; 81: 153-208.]. Ras superfamily GTPases can be classified into one of five families based on structural similarities, the Ras, Rho, Rab, Ran, and Arf families, as well as the “orphan” GTPases Miro1, Miro2, and RhoBTB3. In very general terms, members of each family regulate distinct cellular processes. Ras family GTPases couple extracellular stimuli to regulate cellular gene transcription, proliferation, survival and integrin activity, while Rho family GTPases couple the same stimuli to regulation of gene expression and cytoskeletal organization. Rab and Arf family GTPases control receptor internalization and intracellular vesicular trafficking, while Ran GTPases are responsible for microtubule stability and cargo transport between the cytoplasm and nucleus [19 Colicelli J. Human RAS superfamily proteins and related GTPases Sci STKE 2004; 2004: RE13.]. Roles for Miros and atypical Rho GTPases are just being explored [20 Fransson A, Ruusala A, Aspenstrom P. Atypical Rho GTPases have roles in mitochondrial homeostasis and apoptosis J Biol Chem 2003; 278: 6495-502., 21 Berthold J, Schenkova K, Rivero F. Rho GTPases of the RhoBTB subfamily and tumorigenesis Acta Pharmacol Sin 2008; 29: 285-95.]. Structurally, small GTPases consist of a phosphate-binding loop, responsible for binding guanosine diphosphate (GDP) and guanosine triphosphate (GTP), flexible “switch” regions, which mediate binding to downstream effector proteins, and unique carboxy-terminal tails, modified by the addition of farnesyl or geranylgeranyl moieties, regulating subcellular localization of the GTPase. Cellular stimuli can activate guanine nucleotide exchange factors (GEFs), which displace GDP from specific small GTPases. Freed from GDP, the small GTPase quickly binds GTP, which induces a conformational change allowing the GTPase to associate with and activate multiple downstream signaling proteins. Hydrolysis of bound GTP to GDP, catalyzed by specific GTPase-activating proteins (GAPs), returns the GTPase to its inactive state [22 Bos JL, Rehmann H, Wittinghofer A. GEFs and GAPs: critical elements in the control of small G proteins Cell 2007; 129: 865-77.]. Mutations that abolish or diminish susceptibility to GAPS (e.g., glycine 12 to valine in Ras; RasV12) result in constitutive activation of the small GTPase, while mutations that decrease dissociation from GEFs, preventing binding to GTP (e.g., serine 17 to asparagine in Ras; RasN17) result in dominant-negative molecules which block activation of endogenous GTPases. The closely related Ras family GTPase homologues (H-, K-, and N-Ras) are expressed throughout mammalian tissue, play important roles in coupling extra-cellular stimuli to multiple downstream signaling pathways, and, at least during development, have a high degree of functional redundancy. While no readily evident phenotypes are observed in mice lacking H-Ras, N-Ras or the K-Ras4A splice variant, alone or in combination, genetic deletion of both splice variants of K-Ras results in embryonic lethality [23 Esteban LM, Vicario-Abejon C, Fernandez-Salguero P, et al. Targeted genomic disruption of H-ras and N-ras, individually or in combination, reveals the dispensability of both loci for mouse growth and development Mol Cell Biol 2001; 21: 1444-52., 24 Plowman SJ, Williamson DJ, O'Sullivan MJ, et al. While K-ras is essential for mouse development, expression of the K-ras 4A splice variant is dispensable Mol Cell Biol 2003; 23: 9245-50.]. The ability of many of the Ras homologues to functionally compensate for each other during development likely arises from their highly shared sequence identity, especially in the effector domain coupling GTPases to downstream signaling proteins. Activation of Ras proteins is regulated by three major groups of Ras GEFs, the mammalian son-of-sevenless (mSos) proteins, Ras guanine nucleotide releasing proteins (RasGRPs) and Ras guanine nucleotide-releasing factors (RasGRFs) (Fig. 1 ) [25 Buday L, Downward J. Many faces of Ras activation Biochim Biophys Acta 2008; 1786: 178-87.]. mSos is recruited to activated receptor tyrosine kinase or non-receptor tyrosine kinases via adaptor proteins, resulting in localization of mSos at the plasma membrane. This allows mSos interaction with membrane phospholipids via its pleckstrin homology (PH) domain, and subsequent activation [26 Buday L, Downward J. Epidermal growth factor regulates p21ras through the formation of a complex of receptor, Grb2 adapter protein, and Sos nucleotide exchange factor Cell 1993; 73: 611-20., 27 Byrne JL, Paterson HF, Marshall CJ. p21Ras activation by the guanine nucleotide exchange factor Sos, requires the Sos/Grb2 interaction and a second ligand-dependent signal involving the Sos N-terminus Oncogene 1996; 13: 2055-65.]. RasGRPs are activated to varying degrees by intracellular calcium and/or binding to diacyl glycerol (DAG) or other phorbol esters, while the molecular mechanisms by which RasGRFs are activated have yet to be fully elucidated [25 Buday L, Downward J. Many faces of Ras activation Biochim Biophys Acta 2008; 1786: 178-87., 28 Tognon CE, Kirk HE, Passmore LA, Whitehead IP, Der CJ, Kay RJ. Regulation of RasGRP via a phorbol ester-responsive C1 domain Mol Cell Biol 1998; 18: 6995-7008.-31 Katsoulotos GP, Qi M, Qi JC, et al. The diacylglycerol-dependent translocation of Ras guanine nucleotide-releasing protein 4 inside a human mast cell line results in substantial phenotypic changes, including expression of interleukin 13 receptor alpha 2 J Biol Chem 2008; 283: 1610-21.]. Amongst Ras family GEFs, RasGRF1 appears to have the highest selectivity in vivo, preferentially activating H-Ras but not K-Ras, N-Ras or the more distally related R-Ras [32 Tian X, Feig LA. Basis for signaling specificity difference between Sos and Ras-GRF guanine nucleotide exchange factors J Biol Chem 2001; 276: 47248-56., 33 Jones MK, Jackson JH. Ras-GRF activates Ha-Ras, but not N-Ras or K-Ras 4B, protein in vivo J Biol Chem 1998; 273: 1782-7.]. Well-characterized downstream signaling pathways of Ras family proteins include serine/threonine kinase cascades leading to activation of the mitogen-activated protein (MAP) kinases p38, extracellular-regulated kinase (ERK), and c-jun N-terminal kinase (JNK), phosphatidylinositol 3-kinases (PI3-Ks), and Ral family GEFs (Fig. 1 ) [34 Brown MD, Sacks DB. Protein scaffolds in MAP kinase signalling Cell Signal 2009; 21: 462-9., 35 Hawkins PT, Anderson KE, Davidson K, Stephens LR. Signalling through Class I PI3Ks in mammalian cells Biochem Soc Trans 2006; 34: 647-2.]. Specificity in Ras homologue signaling is conferred in part by differential subcellular localization of each homologue. Unique carboxy (C)-terminal sequences and differential post-translational modifications of the C-terminal peptide direct localization of Ras homologues to distinct cellular membrane compartments, and regulate the inclusion or exclusion of Ras homologues from lipid rafts [36 Hancock JF. Ras proteins: different signals from different locations Nat Rev Mol Cell Biol 2003; 4: 373-84.]. This in turn impacts upon the ability of each Ras protein to interact with distinct GEFs and downstream effector proteins [37 Yan J, Roy S, Apolloni A, Lane A, Hancock JF. Ras isoforms vary in their ability to activate Raf-1 and phosphoinositide 3-kinase J Biol Chem 1998; 273: 24052-6., 38 Voice JK, Klemke RL, Le A, Jackson JH. Four human ras homologs differ in their abilities to activate Raf-1, induce transformation, and stimulate cell motility J Biol Chem 1999; 274: 17164-70.]. Details of MAP kinase and PI3-K involvement in chronic inflammatory autoimmune disease, and developing efforts to target these enzymes therapeutically are discussed elsewhere in this journal series. Genetic analyses of fibroblasts from mice lacking H-Ras or N-Ras indicate that these two GTPases regulate different gene profiles [39 Castellano E, De Las RJ, Guerrero C, Santos E. Transcriptional networks of knockout cell lines identify functional specificities of H-Ras and N-Ras: significant involvement of N-Ras in biotic and defense responses Oncogene 2007; 26: 917-33.]. Lack of N-Ras induces expression of a number of genes involved in innate immune responses and promotion of apoptosis, while down-regulating adhesion molecules and promoters of cell cycling [39 Castellano E, De Las RJ, Guerrero C, Santos E. Transcriptional networks of knockout cell lines identify functional specificities of H-Ras and N-Ras: significant involvement of N-Ras in biotic and defense responses Oncogene 2007; 26: 917-33., 40 Castellano E, Guerrero C, Nunez A, De Las RJ, Santos E. Serum-dependent transcriptional networks identify distinct functional roles for H-Ras and N-Ras during initial stages of the cell cycle Genome Biol 2009; 10: R123.]. Redundancies in H-Ras and N-Ras –dependent gene expression have also been noted in H-Ras-/-/N-Ras-/- double knockout animals. Here, basal and transforming growth factor β1 -induced synthesis of extracellular matrix components is enhanced in fibroblasts lacking both GTPases, associated with suppressed ERK activation and enhanced PI 3-kinase signaling [41 Martinez-Salgado C, Fuentes-Calvo I, Garcia-Cenador B, Santos E, Lopez-Novoa JM. Involvement of H- and N-Ras isoforms in transforming growth factor-beta1-induced proliferation and in collagen and fibronectin synthesis Exp Cell Res 2006; 312: 2093-106.]. Examining immune responses in vivo, mice lacking Ras GEFs and downstream components of the Raf/ERK kinase cascade have severe blocks in both positive selection of thymocytes, and T cell antigen receptor (TCR) responses of peripheral T cells [42 Genot E, Cantrell DA. Ras regulation and function in lymphocytes Curr Opin Immunol 2000; 12: 289-94.]. In N-Ras knockout mice, a partial defect in the positive selection of only CD8+ thymocytes is observed [39 Castellano E, De Las RJ, Guerrero C, Santos E. Transcriptional networks of knockout cell lines identify functional specificities of H-Ras and N-Ras: significant involvement of N-Ras in biotic and defense responses Oncogene 2007; 26: 917-33., 43 Perezd C I, Diaz R, Malumbres M, et al. Mice deficient for N-ras: impaired antiviral immune response and T-cell function Cancer Res 2003; 63: 1615-22.]. These mice are more susceptible than their wild-type counterparts to primary influenza infection, likely due to decreased T cell interleukin (IL)-2 production following antigen stimulation. However, as is the case with many TCR-proximal signaling components, such as ZAP-70, partial inactivation of T cell Ras signaling pathways during development not only interferes with positive selection and peripheral T cell antigen-responsiveness, but, counter-intuitively, induces autoimmunity [44 Thomas R, Turner M, Cope AP. High avidity autoreactive T cells with a low signalling capacity through the T-cell receptor: central to rheumatoid arthritis pathogenesis? Arthritis Res Ther 2008; 10: 10.]. Mice lacking RasGRP1, which in addition to mSos is the major GEF responsible for activating Ras proteins following TCR ligation, display a characteristic decrease in the number of mature CD4+ and CD8+ thymocytes, decreased peripheral T cell numbers and proliferative responses, and an inability to clear bacterial and viral infections [45 Priatel JJ, The SJ, Dower NA, Stone JC, The HS. RasGRP1 transduces low-grade TCR signals which are critical for T cell development, homeostasis, and differentiation Immunity 2002; 17: 617-27.-47 Priatel JJ, Chen X, Dhanji S, Abraham N, The HS. RasGRP1 transmits prodifferentiation TCR signaling that is crucial for CD4 T cell development J Immunol 2006; 177: 1470-80.]. TCR-dependent Ras activation in T cells from these mice, though detectable, is greatly reduced. Despite this, CD4+ T cells which make it to the periphery adopt an activated memory phenotype, and induce systemic autoimmune disease characterized by age-dependent lymphadenopathy, splenomegaly, and auto-antibody production characteristic of SLE [46 Layer K, Lin G, Nencioni A, et al. Autoimmunity as the consequence of a spontaneous mutation in Rasgrp1 Immunity 2003; 19: 243-55.]. Ras, as well as the related GTPase Rap1, is activated during both positive and negative selection, and disease in RasGRP1-deficient mice likely arises from the inability of weakened Ras signaling to transmit pro-apoptotic signals which would otherwise negatively select thymocytes during encounter of high-affinity self-antigens [46 Layer K, Lin G, Nencioni A, et al. Autoimmunity as the consequence of a spontaneous mutation in Rasgrp1 Immunity 2003; 19: 243-55., 48 Amsen D, Kruisbeek A, Bos JL, Reedquist K. Activation of the Ras-related GTPase Rap1 by thymocyte TCR engagement and during selection Eur J Immunol 2000; 30: 2832-41.]. Indeed, direct analyses of TCR β-chain repertoires in RasGRP1-deficient mice under homeostatic conditions shows a pronounced skewing of TCR utilization compared to that found in wild-type (WT) mice [49 Priatel JJ, Chen X, Zenewicz LA, et al. Chronic immunodeficiency in mice lacking RasGRP1 results in CD4 T cell immune activation and exhaustion J Immunol 2007; 179: 2143-52.]. Initial immunohistochemical studies indicated that Ras proteins were expressed in RA synovial tissues, but drew differing conclusions regarding whether Ras expression was elevated in RA synovial tissue compared to disease controls and healthy individuals [5 Trabandt A, Aicher WK, Gay RE, et al. Expression of the collagenolytic and Ras-induced cysteine proteinase cathepsin L and proliferation-associated oncogenes in synovial cells of MRL/I mice and patients with rheumatoid arthritis Matrix 1990; 10: 349-61., 50 Roivainen A, Soderstrom KO, Pirila L, et al. Oncoprotein expression in human synovial tissue: an immunohistochemical study of different types of arthritis Br J Rheumatol 1996; 35: 933-42.]. Recent analyses with homologue-specific antibodies have indicated that similar levels of both K-Ras and N-Ras proteins are found in the synovial tissue of RA patients compared to patients with psoriatic arthritis (PsA), reactive arthritis, and inflammatory osteoarthritis (OA), while H-Ras protein and mRNA expression is selectively elevated in RA, especially in FLS. H-Ras, K-Ras and N-Ras are all expressed at highly variable levels in RA FLS, and each of the homologues is activated following FLS stimulation with IL-1β or TNFα [51 de LD, Vreijling J, Hartkamp LM, et al. Silencing the expression of Ras family GTPase homologues decreases inflammation and joint destruction in experimental arthritis Am J Pathol 2010; 177: 3010-24.]. Basal activation of H-Ras is readily detectable in unstimulated RA FLS in vitro, likely due to over-expression and activating post-translational modification of RasGRF1 [52 Abreu JR, de LD, Sanders ME, et al. The Ras guanine nucleotide exchange factor RasGRF1 promotes matrix metalloproteinase-3 production in rheumatoid arthritis synovial tissue Arthritis Res Ther 2009; 11: R121.]. The activation status of Ras proteins in synovial tissue has not been directly measured, as affinity probes which can precipitate specific activated small GTPases have not proven useful in immunohistochemical studies, and the degree of overlap in Ras homologue signaling pathways precludes the use of surrogate biomarkers to infer the activation status of Ras proteins in synovial tissue. However, one or more of the Ras proteins is constitutively activated in freshly derived RA synovial fluid T cells, likely due to stimulation by multiple inflammatory cytokines present in synovial fluid [53 Remans PH, Gringhuis SI, van Laar JM, et al. Rap1 signaling is required for suppression of Ras-generated reactive oxygen species and protection against oxidative stress in T lymphocytes J Immunol 2004; 173: 920-31.]. 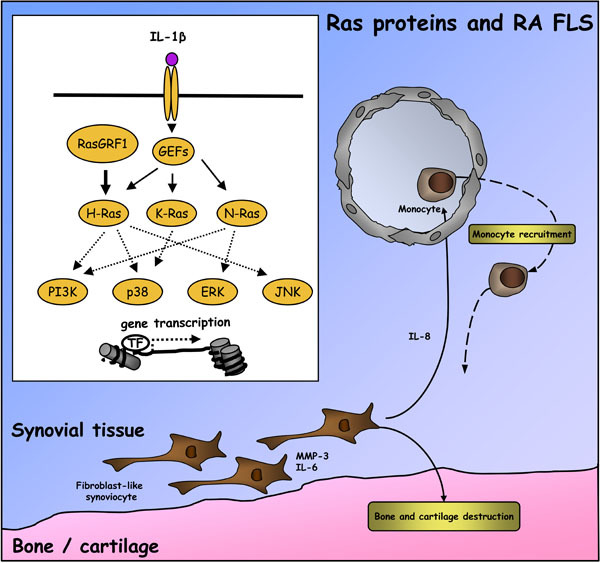 Numerous independent studies have provided evidence that Ras proteins play an important role in RA FLS activation, and contribute to pathology in animal models of RA. Farnesyltransferase inhibitors (FTI), which prevent proper membrane localization of Ras proteins, some Rho family GTPases, and signaling components of G protein-coupled receptors, decrease the incidence and severity of collagen-induced arthritis (CIA) in mice, accompanied by decreased synovial TNFα and IL-1β mRNA expression [54 Na HJ, Lee SJ, Kang YC, et al. Inhibition of farnesyltransferase prevents collagen-induced arthritis by down-regulation of inflammatory gene expression through suppression of p21(ras)- dependent NF-kappaB activation J Immunol 2004; 173: 1276-83., 55 Philips MR, Cox AD. Geranylgeranyltransferase I as a target for anti-cancer drugs J Clin Invest 2007; 117: 1223-5.]. FTI also inhibit TNFα-induced MMP-1 production in RA FLS, accompanied by decreased activation of JNK and NF-êB signaling pathways [56 Abeles AM, Marjanovic N, Park J, et al. Protein isoprenylation regulates secretion of matrix metalloproteinase 1 from rheumatoid synovial fibroblasts: effects of statins and farnesyl and geranylgeranyl transferase inhibitors Arthritis Rheum 2007; 56: 2840-53.]. Over-expression of a dominant-negative c-Raf kinase in RA FLS, which broadly binds to and inhibits Ras homologues and related Ras family members, suppresses growth factor-induced activation of ERK and JNK MAP kinases, interferes with FLS MMP production, and slows FLS proliferation and invasiveness in vivo [57 Pap T, Nawrath M, Heinrich J, et al. Cooperation of Ras- and c- Myc-dependent pathways in regulating the growth and invasiveness of synovial fibroblasts in rheumatoid arthritis Arthritis Rheum 2004; 50: 2794-802., 58 Herrmann C, Horn G, Spaargaren M, Wittinghofer A. Differential interaction of the ras family GTP-binding proteins H-Ras, Rap1A, and R-Ras with the putative effector molecules Raf kinase and Ralguanine nucleotide exchange factor J Biol Chem 1996; 271: 6794-800.]. Presumably more selective interference with H-Ras signaling, via ectopic expression of dominant-negative H-Ras, suppresses IL-1β -induced ERK activation and IL-6 production in RA FLS, and suppresses joint destruction in experimental arthritis [59 Yamamoto A, Fukuda A, Seto H, et al. Suppression of arthritic bone destruction by adenovirus-mediated dominant-negative Ras gene transfer to synoviocytes and osteoclasts Arthritis Rheum 2003; 48: 2682-92.]. Additional evidence for a specific role for H-Ras in RA is derived from studies indicating that RasGRF1 is highly expressed in RA synovial tissue and FLS, and detected in a cleaved form thought to result in its constitutive activation in RA [52 Abreu JR, de LD, Sanders ME, et al. The Ras guanine nucleotide exchange factor RasGRF1 promotes matrix metalloproteinase-3 production in rheumatoid arthritis synovial tissue Arthritis Res Ther 2009; 11: R121.]. RasGRF1 expression in RA synovial tissue co-localizes and correlates with MMP-3 production, and in vitro contributes to constitutive MMP-3, IL-6 and IL-8 production by RA FLS [52 Abreu JR, de LD, Sanders ME, et al. The Ras guanine nucleotide exchange factor RasGRF1 promotes matrix metalloproteinase-3 production in rheumatoid arthritis synovial tissue Arthritis Res Ther 2009; 11: R121.]. Interestingly, protease-dependent cleavage of RasGRF1 was previously identified as an important mechanism for driving H-Ras activation and invasiveness in melanoma cancer cell lines, drawing yet another striking similarity between RA FLS and cancer cell phenotypes [60 Baouz S, Jacquet E, Bernardi A, Parmeggiani A. The N-terminal moiety of CDC25(Mm), a GDP/GTP exchange factor of Ras proteins, controls the activity of the catalytic domain. Modulation by calmodulin and calpain J Biol Chem 1997; 272: 6671-., 61 Zhu TN, He HJ, Kole S, et al. Filamin A-mediated down-regulation of the exchange factor Ras-GRF1 correlates with decreased matrix metalloproteinase-9 expression in human melanoma cells J Biol Chem 2007; 282: 14816-26.]. Contributions of distinct Ras family members to cellular function in RA synovial tissue are now being addressed through more systematic approaches. Although it is likely that all Ras homologues are activated in RA synovial fluid T cells, persistent reactive oxygen species (ROS) production observed in these cells can be mimicked in Jurkat T cells by transfection of active H-Ras, but not K-Ras or N-Ras [53 Remans PH, Gringhuis SI, van Laar JM, et al. Rap1 signaling is required for suppression of Ras-generated reactive oxygen species and protection against oxidative stress in T lymphocytes J Immunol 2004; 173: 920-31., 62 Remans PH, van Oosterhout M, Smeets TJ, et al. Intracellular free radical production in synovial T lymphocytes from patients with rheumatoid arthritis Arthritis Rheum 2005; 52: 2003-9.]. In this experimental system, H-Ras –induced ROS production requires the downstream small GTPase Ral, and a cell-permeable inhibitor of H-Ras can block synovial fluid T cell ROS production. In RA FLS, each of the Ras homologues contributes to autonomous cellular activation, as well as cellular responses to IL-1β [51 de LD, Vreijling J, Hartkamp LM, et al. Silencing the expression of Ras family GTPase homologues decreases inflammation and joint destruction in experimental arthritis Am J Pathol 2010; 177: 3010-24.]. Consistent with effects observed during manipulation of RasGRF1 expression levels in RA FLS, transfection of RA FLS with active H-Ras, but not K-Ras or N-Ras, enhances basal MMP-3 production. However, active mutants of each of the Ras homologues can enhance basal IL-1β-induced MMP-3 production. For IL-8, active mutants of Ras protein can enhance basal production, but only active H-Ras cooperates with IL-1β to further stimulate IL-8 expression. In reciprocal experiments silencing Ras homologue expression in RA FLS, H-Ras was found to be required for basal IL-6 and MMP-3 production, while N-Ras activity was required for IL-8 expression. Each of the Ras homologues contributed to IL-1β -induced IL-6 production, while selective requirements were observed for H-Ras and N-Ras in the induction of MMP-3 and IL-8 respectively [51 de LD, Vreijling J, Hartkamp LM, et al. Silencing the expression of Ras family GTPase homologues decreases inflammation and joint destruction in experimental arthritis Am J Pathol 2010; 177: 3010-24.]. Expression of active K-Ras has also been observed to enhance RA FLS proliferation in vitro, although this effect can be suppressed by TNFα or TGFβ [63 Kitasato H, Noda M, Akahoshi T, et al. Activated Ras modifies the proliferative response of rheumatoid synovial cells to TNF-alpha and TGF-alpha Inflamm Res 2001; 50: 592-7.]. These data would collectively suggest that although specific signaling attributes can be identified for each Ras homologue in FLS activation, each Ras protein contributes to global parameters mediating inflammation and joint destruction. In keeping with this, use of pan-Ras locked nucleic acid (LNA) to simultaneously knockdown all three Ras homologues in vivo showed superior efficacy to N-Ras LNA in protecting mice against CIA. One caveat to this conclusion, however, is that synovial analysis of Ras family mRNA expression following pan-Ras LNA treatment indicated that, locally, H-Ras expression was most efficiently targeted by the pan-Ras LNA [51 de LD, Vreijling J, Hartkamp LM, et al. Silencing the expression of Ras family GTPase homologues decreases inflammation and joint destruction in experimental arthritis Am J Pathol 2010; 177: 3010-24.]. Together, this data suggests a scenario in RA synovial tissue FLS where constitutive activation of H-Ras by RasGRF1synergizes with inflammation-dependent activation of K- and N-Ras to promote FLS activation (Fig. 1 ). The first indication that Ras family GTPases may contribute to cellular activation in SLE was reported in a pioneering observation from Klinman and colleagues, where they noted that expression of N-Ras, among other proto-oncogene products, was over-expressed in peripheral blood mononuclear cells of SLE patients [14 Klinman DM, Mushinski JF, Honda M, Ishigatsubo Y, Mountz JD, Raveche ES, et al. Oncogene expression in autoimmune and normal peripheral blood mononuclear cells J Exp Med 1986; 163: 1292-307.]. Other investigators have also identified decreased expression of the Ras family GEF SOS in SLE patient PBMCs, associated with constitutively high activation of cellular kinase activity attributed to ERK1 and ERK2 MAP kinases [64 Rapoport MJ, Mor A, Amit M, et al. Decreased expression of the p21ras stimulatory factor hSOS in PBMC from inactive SLE patients Lupus 1999; 8: 24-8., 65 Rapoport MJ, Amit M, Aharoni D, et al. Constitutive up-regulated activity of MAP kinase is associated with down-regulated early p21Ras pathway in lymphocytes of SLE patients J Autoimmun 2002; 19: 63-70.]. More recent studies to detect specific MAP kinase activation have provided evidence that activation of ERK and JNK, but not p38, in SLE patient PBMCs correlates with disease activity [66 Molad Y, mit-Vasina M, Bloch O, Yona E, Rapoport MJ. Increased ERK and JNK activities correlate with disease activity in patients with systemic lupus erythematosus Ann Rheum Dis 2010; 69: 175-80.]. In contrast to bulk PBMCs, T cells from SLE patients are defective in their ability to mount a proliferative response, associated with an inability to integrate TCR signaling with CD28 and ICOS costimulatory pathways [67 Gang C, Jiahui Y, Huaizhou W, Qing C, Dongbao Z, Qian S. Defects of mitogen-activated protein kinase in ICOS signaling pathway lead to CD4(+) and CD8(+) T-cell dysfunction in patients with active SLE Cell Immunol 2009; 258: 83-9.]. Defective ERK activation following SLE T cell stimulation may be attributed in part to defective coupling of SOS to the adaptor protein Grb2 [68 Cedeno S, Cifarelli DF, Blasini AM, et al. Defective activity of ERK-1 and ERK-2 mitogen-activated protein kinases in peripheral blood T lymphocytes from patients with systemic lupus erythematosus: potential role of altered coupling of Ras guanine nucleotide exchange factor hSos to adapter protein Grb2 in lupus T cells Clin Immunol 2003; 106: 41-9.]. Intriguingly, a study of a relatively small group of normal donors and SLE patients identified 13 novel splice variants of RasGRP1 in PBMCs, many of which encoded defective transcripts [69 Yasuda S, Stevens RL, Terada T, et al. Defective expression of Ras guanyl nucleotide-releasing protein 1 in a subset of patients with systemic lupus erythematosus J Immunol 2007; 179: 4890-900.]. Expression of these defective RasGRP1 transcripts was enhanced in SLE PBMCs, and in T lymphocytes, RasGRP1 expression was often diminished or undetectable. Again, although a causal role remains to be established for altered Ras signaling in SLE pathology, this last molecular observation is striking given the lupus-like phenotype of RasGRP1-deficient mice [45 Priatel JJ, The SJ, Dower NA, Stone JC, The HS. RasGRP1 transduces low-grade TCR signals which are critical for T cell development, homeostasis, and differentiation Immunity 2002; 17: 617-27., 46 Layer K, Lin G, Nencioni A, et al. Autoimmunity as the consequence of a spontaneous mutation in Rasgrp1 Immunity 2003; 19: 243-55., 49 Priatel JJ, Chen X, Zenewicz LA, et al. Chronic immunodeficiency in mice lacking RasGRP1 results in CD4 T cell immune activation and exhaustion J Immunol 2007; 179: 2143-52., 70 Priatel JJ, Chen X, Huang YH, et al. RasGRP1 regulates antigen-induced developmental programming by naive CD8 T cells J Immunol 2010; 184: 666-76.]. No studies have yet examined the effects of targeting other Ras family signaling components in animal models of SLE, but administration of FTI does suppress disease in lupus-prone mice, again suggesting involvement of Ras or related proteins [71 Katzav A, Kloog Y, Korczyn AD, et al. Treatment of MRL/lpr mice, a genetic autoimmune model, with the Ras inhibitor, farnesylthiosalicylate (FTS) Clin Exp Immunol 2001; 126: 570-7.]. The Rap family consists of Rap1 (a and b) and Rap2 (a and b), each of which is encoded by distinct genes but share 95% amino acid identity [72 Bos JL, de Rooij J, Reedquist KA. Rap1 signalling: adhering to new models Nat Rev Mol Cell Biol 2001; 2: 369-77.]. In over-expression systems, it is difficult to discern differences between Rap proteins in their ability to regulate cellular functions, but as discussed below, targeted disruption of individual genes in vivo is clearly defining roles for Rap1a and Rap1b in distinct cell populations. Rap GEFs are activated by a wide range of protein-protein interactions, as well as by soluble second signaling messengers. These GEFs include C3G (similarly to mSOS, recruited to tyrosine-phosphorylated receptors and complexes via the SH2 domain of an associated adaptor protein), postsynaptic density 95/disc-large/zona occludens (PDZ)-GEFs I and II, exchange proteins directly activated by cAMP (EPAC) 1 and 2, and calcium and diacylglycerol regulated GEF (CalDAG-GEF, RasGRP2). Two groups of GAPs regulate inactivation of Rap proteins, the RapGAP (RapGAP1A, RapGAP1B, and RapGAP2) and Spa-1 (Spa-1, Spa-1-like, and E6TP1) families [22 Bos JL, Rehmann H, Wittinghofer A. GEFs and GAPs: critical elements in the control of small G proteins Cell 2007; 129: 865-77.]. The best-characterized function of Rap1 proteins is the regulation of adhesion proteins in cells of both hematopoietic and non-hematopoietic origin. Rap1 protein activation mediates integrin activation, integrin-dependent chemotaxis, cadherin-mediated adhesion, and cell-cell junction formation, likely via the activation of multiple coordinated signaling pathways. One downstream effector of Rap1 proteins important in integrin-dependent adhesion is Riam, an adaptor protein which in turn interacts with actin regulatory proteins, talin, ADAP (adhesion- and degranulation-promoting adaptor protein), and SKAP-55 (Src kinase-associated phosphoprotein of 55 kDa) [73 Lafuente EM, van Puijenbroek AA, Krause M, et al. RIAM, an Ena/VASP and Profilin ligand, interacts with Rap1-GTP and mediates Rap1-induced adhesion Dev Cell 2004; 7: 585-95.-75 Menasche G, Kliche S, Chen EJ, Stradal TE, Schraven B, Koretzky G. RIAM links the ADAP/SKAP-55 signaling module to Rap1, facilitating T-cell-receptor-mediated integrin activation Mol Cell Biol 2007; 27: 4070-81.]. Active Rap1 can also associate with RAPL (regulator of adhesion and cell polarization enriched in lymphoid tissues, also known as Nore1B and Rassf5), an adaptor protein which couples Rap1 to and activates the serine-threonine kinase mammalian sterile twenty-like-1 (Mst1) to induce LFA-1 clustering [76 Katagiri K, Maeda A, Shimonaka M, Kinashi T. RAPL, a Rap1- binding molecule that mediates Rap1-induced adhesion through spatial regulation of LFA-1 Nat Immunol 2003; 4: 741-8., 77 Katagiri K, Imamura M, Kinashi T. Spatiotemporal regulation of the kinase Mst1 by binding protein RAPL is critical for lymphocyte polarity and adhesion Nat Immunol 2006; 7: 919-28.]. In vitro studies have also indicated that afadin (AF-6) is a Rap1 effector, which inhibits endocytosis of E-cadherin and allows the maintenance of cellular junctions [78 Price LS, Hajdo-Milasinovic A, Zhao J, Zwartkruis FJ, Collard JG, Bos JL. Rap1 regulates E-cadherin-mediated cell-cell adhesion J Biol Chem 2004; 279: 35127-2.-80 Hoshino T, Sakisaka T, Baba T, Yamada T, Kimura T, Takai Y. Regulation of E-cadherin endocytosis by nectin through afadin, Rap1, and p120ctn J Biol Chem 2005; 280: 24095-103.]. Finally, Rap1 can directly couple to and regulate multiple GEFs and GAPs for Rho family GTPases, providing a link between integrin adhesion and cytoskeletal remodeling [81 Raaijmakers JH, Bos JL. Specificity in Ras and Rap signaling J Biol Chem 2008; 284: 10995-9.]. The study of a large number of genetically-modified mice strains has collectively identified specific roles for Rap1a and Rap1b in lymphocyte activation and trafficking, innate immunity, angiogenesis and maintenance of vascular integrity. Initial studies focused on the role of Rap1a in T cell biology. Transgenic over-expression of constitutively active Rap1a-E63 in the T cell compartment of mice confers constitutive LFA-1 integrin activation to thymocytes and peripheral T lymphocytes. In these mice, reduced CD4+ T lymphocyte proliferative responses to anti-CD3 antibodies as well as recall antigens, and T cell help for B cell Ig class switching are observed [82 Li L, Greenwald RJ, Lafuente EM, et al. Rap1-GTP is a negative regulator of Th cell function and promotes the generation of CD4+CD103+ regulatory T cells in vivo J Immunol 2005; 175: 3133-9.]. Although suppressed CD4+ Th cell proliferative responses in Rap1a-E63 transgenic mice are to some extent cell-intrinsic effects, the numbers and immunosuppressive capacity of FoxP3+ regulatory T cells (Tregs) is also increased. In these mice, Rap1a-E63 promotes development of naturally occurring Tregs by LFA-1 integrin-independent mechanisms, although integrin activation partially contributes to Rap1-induced differentiation of inducible Tregs [83 Li L, Kim J, Boussiotis VA. Rap1A regulates generation of T regulatory cells via LFA-1-dependent and LFA-1-independent mechanisms Cell Immunol 2010; 266: 7-13.]. Intriguingly, transgenic expression of another active Rap1a mutant, Rap1a-V12, in T cells only partially phenocopies Rap1a-E63 mice [84 Sebzda E, Bracke M, Tugal T, Hogg N, Cantrell DA. Rap1A positively regulates T cells via integrin activation rather than inhibiting lymphocyte signaling Nat Immunol 2002; 3: 251-8.]. In contrast to Rap1a-E63, which is a constitutively active mutant lacking intrinsic GTPase activity that is insensitive to GAPs, Rap1a-V12 is a hypermorphic mutant displaying an approximately 200 –fold decrease in sensitivity to GAPs [22 Bos JL, Rehmann H, Wittinghofer A. GEFs and GAPs: critical elements in the control of small G proteins Cell 2007; 129: 865-77.]. Additionally, unlike Rap1a-E63, which is over-expressed compared to endogenous Rap1a, Rap1a-V12 is expressed at levels comparable to endogenous Rap1. As a result, T cell Rap1a activity levels in Rap1a-V12 transgenic mice are comparable to those achieved by phorbol ester and ionomycin stimulation of endogenous Rap1a [84 Sebzda E, Bracke M, Tugal T, Hogg N, Cantrell DA. Rap1A positively regulates T cells via integrin activation rather than inhibiting lymphocyte signaling Nat Immunol 2002; 3: 251-8.]. Thymocytes and T cells from Rap1a-V12 transgenic mice do display constitutive integrin activation, but no impairment in TCR/CD28 –induced ERK activation or proliferation [84 Sebzda E, Bracke M, Tugal T, Hogg N, Cantrell DA. Rap1A positively regulates T cells via integrin activation rather than inhibiting lymphocyte signaling Nat Immunol 2002; 3: 251-8.]. Additionally, Rap1a-V12 has no influence on TCR/CD28-induced IL-2, IFNγ, or TNFα production, nor the development or induction of Tregs and Th17 cells [85 Abreu JR, Krausz S, Dontje W, et al. Sustained T cell Rap1 signaling is protective in the collagen-induced arthritis model of rheumatoid arthritis Arthritis Rheum 2010; 62: 3289-99.]. This may suggest that many of the phenotypes observed in Rap1a-E63 are consequences of non-physiological Rap1a signaling. However, mice lacking Spa-1, a RapGAP enriched in hematopoietic tissues, particularly in proliferating T lymphocytes, display an age-dependent decrease in T cell proliferative responses to CD3/CD28 and recall antigen stimulation, and are unable to generate effective antibody responses [86 Ishida D, Yang H, Masuda K, et al. Antigen-driven T cell anergy and defective memory T cell response via deregulated Rap1 activation in SPA-1-deficient mice Proc Natl Acad Sci USA 2003; 100: 10919-24.]. Later in life, these mice also generate auto-reactive B cells [87 Ishida D, Su L, Tamura A, et al. Rap1 signal controls B cell receptor repertoire and generation of self-reactive B1a cells Immunity 2006; 24: 417-27.]. Genetic deletion of Rap1a has no overt effect on B or T cell development, nor lymphocyte proliferative responses to antigen receptor ligation. However, lymphocyte integrin function is modestly reduced, demonstrating both a physiological role for Rap1a in integrin activation, as well as likely functional redundancies with Rap1b [88 Li Y, Yan J, De P, et al. Rap1a null mice have altered myeloid cell functions suggesting distinct roles for the closely related Rap1a and 1b proteins J Immunol 2007; 179: 8322-31., 89 Duchniewicz M, Zemojtel T, Kolanczyk M, Grossmann S, Scheele JS, Zwartkruis FJ. Rap1A-deficient T and B cells show impaired integrin-mediated cell adhesion Mol Cell Biol 2006; 26: 643-53.]. An independent study of Rap1b knockout mice has indicated that Rap1b is the major Rap1 protein expressed in T cells, but potential impacts of Rap1b on T cell function have not been reported [90 Chu H, Awasthi A, White GC, Chrzanowska-Wodnicka M, Malarkannan S. Rap1b regulates B cell development, homing, and T cell-dependent humoral immunity J Immunol 2008; 181: 3373-83.]. To date, the quality of T cell immune responses in vivo in mice lacking Rap1a or Rap1b have not been examined. However, mice transgenically expressing RapGAP1 in the T cell compartment display an age-dependent accumulation of activated T cells in spleen and lymph nodes, and these T cells are hyper-responsive to mitogenic stimulation [91 Dillon TJ, Carey KD, Wetzel SA, Parker DC, Stork PJ. Regulation of the small GTPase Rap1 and extracellular signal-regulated kinases by the costimulatory molecule CTLA-4 Mol Cell Biol 2005; 25: 4117-28.]. Rap1b knockout mice display a strong B cell phenotype, demonstrating a required role for Rap1b in maintaining integrin function during B cell development, homing, and T cell interactions in vivo [92 Chrzanowska-Wodnicka M, Kraus AE, Gale D, White GC, Vansluys J. Defective angiogenesis, endothelial migration, proliferation, and MAPK signaling in Rap1b-deficient mice Blood 2008; 111: 2647-56.]. Numbers of B220+IgM- pro/pre –B cells and B220+IgM+ immature B cells are reduced in Rap1b –deficient mice, as are marginal zone B cells in the spleen. Proliferative responses of B cells are unaffected, as are T cell-independent humoral responses, while T cell-dependent antibody responses are greatly reduced. Intriguingly, recent evidence has emerged that signals generated by Rap1 through RAPL bifurcate into pathways regulating both cellular adhesion and cell cycling [93 Katagiri K, Ueda Y, Tomiyama T, et al. Deficiency of Rap1- Binding Protein RAPL Causes Lymphoproliferative Disorders through Mislocalization of p27kip1 Immunity 2011; 34: 24-38.]. Although young RAPL-/- mice are lymphopenic, aged mice display lymphoproliferative disease, associated with the development of lupus-like antibody production, and B cell lymphomas. Initial studies indicate that in addition to regulating integrin activation, RAPL couples antigen receptor stimulation to suppression of kinase interacting stathmin (KIS) -dependent phosphorylation and nuclear localization of the cell cycle regulator p27kip1. Rap1 signaling is also important for myeloid cell homing and function in vivo. Integrin-dependent adhesion to fibronectin and vitronectin is reduced in macrophages from mice lacking Rap1a, and macrophages from these mice demonstrate increased random movement on adhesive matrices [88 Li Y, Yan J, De P, et al. Rap1a null mice have altered myeloid cell functions suggesting distinct roles for the closely related Rap1a and 1b proteins J Immunol 2007; 179: 8322-31.]. Fc-R-mediated phagocytosis is slightly increased in Rap1a-deficient macrophages, while oxidative bursts are decreased. Differences between Rap1a-deficient and WT macrophages are relatively moderate, again indicative of functional redundancies between Rap1a and Rap1b. Downstream of Rap1, RAPL is essential not only for T and B cell homing in vivo, but also the migration of dendritic cells to spleen and draining lymph nodes during immune challenge [94 Katagiri K, Ohnishi N, Kabashima K, et al. Crucial functions of the Rap1 effector molecule RAPL in lymphocyte and dendritic cell trafficking Nat Immunol 2004; 5: 1045-51., 95 Ebisuno Y, Katagiri K, Katakai T, et al. Rap1 controls lymphocyte adhesion cascade and interstitial migration within lymph nodes in RAPL-dependent and -independent manners Blood 2010; 115: 804-14.]. Lastly, Rap1 function appears to play a key role in angiogenesis and vascular endothelial integrity. Rap1a-deficient mice demonstrate reduced neovascularization following hind limb ischemia, while decreased retinal neovascularization is observed in Rap1b-deficient mice [92 Chrzanowska-Wodnicka M, Kraus AE, Gale D, White GC, Vansluys J. Defective angiogenesis, endothelial migration, proliferation, and MAPK signaling in Rap1b-deficient mice Blood 2008; 111: 2647-56., 96 Carmona G, Gottig S, Orlandi A, et al. Role of the small GTPase Rap1 for integrin activity regulation in endothelial cells and angiogenesis Blood 2009; 113: 488-97.]. Decreased blood vessel formation, induced by VEGF, bFGF, and FGF2, is observed in Matrigel plugs implanted into mice lacking either Rap1a or Rap1b, and endothelial cells derived from these mice display decreased integrin activation, migration, and permeability in vitro [92 Chrzanowska-Wodnicka M, Kraus AE, Gale D, White GC, Vansluys J. Defective angiogenesis, endothelial migration, proliferation, and MAPK signaling in Rap1b-deficient mice Blood 2008; 111: 2647-56., 96 Carmona G, Gottig S, Orlandi A, et al. Role of the small GTPase Rap1 for integrin activity regulation in endothelial cells and angiogenesis Blood 2009; 113: 488-97., 97 Yan J, Li F, Ingram DA, Quilliam LA. Rap1a is a key regulator of fibroblast growth factor 2-induced angiogenesis and together with Rap1b controls human endothelial cell functions Mol Cell Biol 2008; 28: 5803-10.]. At least in vitro, Rap1 regulation of neovascularization is partially dependent upon signaling to RAPL [92 Chrzanowska-Wodnicka M, Kraus AE, Gale D, White GC, Vansluys J. Defective angiogenesis, endothelial migration, proliferation, and MAPK signaling in Rap1b-deficient mice Blood 2008; 111: 2647-56., 97 Yan J, Li F, Ingram DA, Quilliam LA. Rap1a is a key regulator of fibroblast growth factor 2-induced angiogenesis and together with Rap1b controls human endothelial cell functions Mol Cell Biol 2008; 28: 5803-10.]. The role of Rap1 signaling in RA has been investigated primarily within the context of T cell contributions to pathology. Initial indications that Rap1 activation may contribute to T cell anergy, coupled to studies reporting that RA synovial T cells were unresponsive to TCR signaling, suggested the possibility that Rap1 may be aberrantly activated in RA synovial T cells. Suprisingly, analysis of Rap1 activation status in RA synovial fluid T cells revealed a complete block in CD3 and phorbol ester/ionomycin –induced Rap1 activation [53 Remans PH, Gringhuis SI, van Laar JM, et al. Rap1 signaling is required for suppression of Ras-generated reactive oxygen species and protection against oxidative stress in T lymphocytes J Immunol 2004; 173: 920-31.]. Subsequent studies found that inactivation of RA synovial fluid T cell Rap1 was mediated by the T cell costimulatory protein CD28. Synovial fluid T cell Rap1 inactivation could be mimicked in RA patient peripheral blood T cells incubated with autologous synovial fluid macrophages, or peripheral blood-derived macrophages exposed to synovial fluid, in a cell contact-dependent manner [98 Remans PH, Wijbrandts CA, Sanders ME, et al. CTLA-4IG suppresses reactive oxygen species by preventing synovial adherent cell-induced inactivation of Rap1, a Ras family GTPASE mediator of oxidative stress in rheumatoid arthritis T cells Arthritis Rheum 2006; 54: 3135-43.]. Previous work had already demonstrated that TCR-dependent activation of Rap1 could be efficiently blocked by CD28 costimulation, and inclusion of CTLA4-Ig (Abatacept) in T cell-synovial fluid macrophage co-cultures prevented Rap1 inactivation (Fig. 2 ) [91 Dillon TJ, Carey KD, Wetzel SA, Parker DC, Stork PJ. Regulation of the small GTPase Rap1 and extracellular signal-regulated kinases by the costimulatory molecule CTLA-4 Mol Cell Biol 2005; 25: 4117-28., 98 Remans PH, Wijbrandts CA, Sanders ME, et al. CTLA-4IG suppresses reactive oxygen species by preventing synovial adherent cell-induced inactivation of Rap1, a Ras family GTPASE mediator of oxidative stress in rheumatoid arthritis T cells Arthritis Rheum 2006; 54: 3135-43., 99 Reedquist KA, Bos JL. Costimulation through CD28 suppresses T cell receptor-dependent activation of the Ras-like small GTPase Rap1 in human T lymphocytes J Biol Chem 1998; 273: 4944-9.]. Maintenance of Rap1 signaling by CTLA4-Ig was associated with a failure of T cells to produce high levels of ROS, and transduction of T cells with Rap1a-V12 prior to their incubation with synovial macrophages also blocked subsequent T cell ROS production [98 Remans PH, Wijbrandts CA, Sanders ME, et al. CTLA-4IG suppresses reactive oxygen species by preventing synovial adherent cell-induced inactivation of Rap1, a Ras family GTPASE mediator of oxidative stress in rheumatoid arthritis T cells Arthritis Rheum 2006; 54: 3135-43.]. ROS are proposed to act as important second messengers in T cell activation, and scavenging intracellular ROS has been shown to suppress TCR-induced NF-κB, AP-1 and IL-2 promoter transcription [100 Tatla S, Woodhead V, Foreman JC, Chain BM. The role of reactive oxygen species in triggering proliferation and IL-2 secretion in T cells Free Radic Biol Med 1999; 26: 14-24.]. Reciprocally, chronic T cell oxidative stress can lead to constitutive activation of NF-κB -dependent inflammatory gene products [101 Hehner SP, Breitkreutz R, Shubinsky G, et al. Enhancement of T cell receptor signaling by a mild oxidative shift in the intracellular thiol pool J Immunol 2000; 165: 4319-28.]. Together, these studies indicated that restoration or maintenance of Rap1 function in T cells might alleviate their pathological contributions to RA. Consistent with this, Rap1a-V12 mice are highly resistant to clinical manifestations of CIA [85 Abreu JR, Krausz S, Dontje W, et al. Sustained T cell Rap1 signaling is protective in the collagen-induced arthritis model of rheumatoid arthritis Arthritis Rheum 2010; 62: 3289-99.]. Rap1a-V12 mice show decreased disease incidence and severity, and undetectable levels of cartilage and bone damage. Protection against CIA in Rap1a-V12 mice is also associated with decreased anti-collagen autoantibody production. The precise cellular and molecular mechanisms by which sustained T cell Rap1 activity protects mice against CIA are currently unknown, but their delineation will be necessary in establishing the potential of T cell Rap1 modulation as a therapeutic strategy in established RA. It is unlikely that Rap1a-V12 expression impacts on the TCR repertoire during selection to remove auto-immune T cells, as previous characterization of these mice found little evidence of Rap1 effects on positive and negative selection [84 Sebzda E, Bracke M, Tugal T, Hogg N, Cantrell DA. Rap1A positively regulates T cells via integrin activation rather than inhibiting lymphocyte signaling Nat Immunol 2002; 3: 251-8.]. Rap1a-V12 also fails to induce T cell anergy in the CIA model, as TCR/CD28 proliferative and cytokine responses in healthy Rap1a-V12 mice are normal [84 Sebzda E, Bracke M, Tugal T, Hogg N, Cantrell DA. Rap1A positively regulates T cells via integrin activation rather than inhibiting lymphocyte signaling Nat Immunol 2002; 3: 251-8., 85 Abreu JR, Krausz S, Dontje W, et al. Sustained T cell Rap1 signaling is protective in the collagen-induced arthritis model of rheumatoid arthritis Arthritis Rheum 2010; 62: 3289-99.]. Moreover, during the onset of CIA, the distribution and number of effector/memory T cells is identical in Rap1a-V12 and WT mice, and Rap1a-V12 splenic and lymph node T cells make expected levels of IL-2, IFNγ, IL-17 and IL-10. Also, Rap1a-V12 mice behave identically in terms of clinical responses, viral clearance, antibody production, and CD4+ and CD8+ T cell homing and cytokine responses during primary and secondary influenza infection (our unpublished observation). Intriguingly however, there is a specific defect in Rap1a-V12 lymph node T cell production of TNFα [85 Abreu JR, Krausz S, Dontje W, et al. Sustained T cell Rap1 signaling is protective in the collagen-induced arthritis model of rheumatoid arthritis Arthritis Rheum 2010; 62: 3289-99.]. This might be due to clonal exhaustion of autoimmune T cell clones, a phenomenon previously observed in murine antigen-specific T cell populations during chronic viral infection [102 Wherry EJ, Ha SJ, Kaech SM, et al. Molecular signature of CD8+ T cell exhaustion during chronic viral infection Immunity 2007; 27: 670-84., 103 Fuller MJ, Khanolkar A, Tebo AE, Zajac AJ. Maintenance, loss, and resurgence of T cell responses during acute, protracted, and chronic viral infections J Immunol 2004; 172: 4204-14.]. Secondly, under highly inflammatory conditions, Rap1a-V12-mediated integrin activation may prolong T cell contact with antigen-presenting cells, leading to activation-induced cell death. Such an effect of T cell Rap1 activation has previously been observed in vitro [104 Katagiri K, Hattori M, Minato N, Kinashi T. Rap1 functions as a key regulator of T-cell and antigen-presenting cell interactions and modulates T-cell responses Mol Cell Biol 2002; 22: 1001-5.]. Finally, the specific lack of TNFα production may be due to the inability of Rap1a-V12 T cells to up-regulate costimulatory expression needed for TNFα production. In vitro, Rap1a-V12 T cells from healthy mice show a modest decrease in ICOS and CD154 expression following TCR/CD28 stimulation [85 Abreu JR, Krausz S, Dontje W, et al. Sustained T cell Rap1 signaling is protective in the collagen-induced arthritis model of rheumatoid arthritis Arthritis Rheum 2010; 62: 3289-99.]. Engagement of these costimulatory proteins is important not only for T cell TNFα production, but is also required for follicular T cell help that promotes B cell immunoglobulin class switching [105 Gonzalo JA, Delaney T, Corcoran J, Goodearl A, Gutierrez-Ramos JC, Coyle AJ. Cutting edge: the related molecules CD28 and inducible costimulator deliver both unique and complementary signals required for optimal T cell activation J Immunol 2001; 166: 1-5., 106 McAdam AJ, Greenwald RJ, Levin MA, et al. ICOS is critical for CD40-mediated antibody class switching Nature 2001; 409: 102-5.]. It remains to be established whether Rap1a-V12 T cells also fail to induce ICOS and CD154 expression during CIA in vivo. 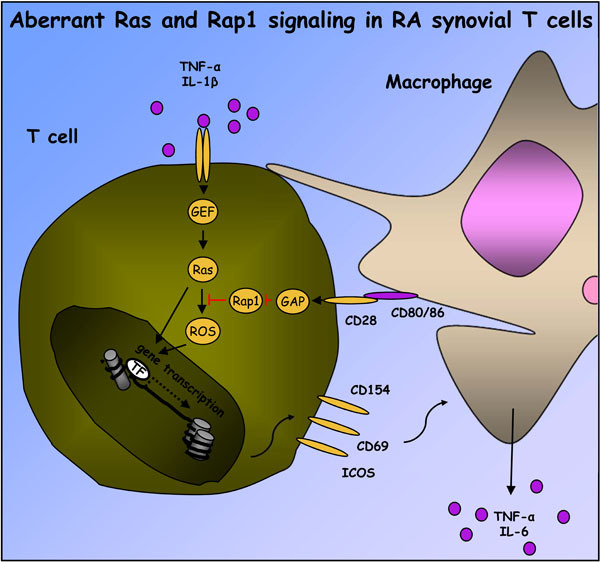 However, available data suggests a model wherein constitutive activation of Ras proteins by synovial inflammatory cytokines, in combination with macrophage-dependent CD28 costimulation of T cells and Rap1 inactivation, leads to synovial T cell ROS production and expression of activation markers which further stimulate macrophages (Fig. 2 ). Despite a large community interest in the role of integrins and cadherins in the migratory and invasive properties of RA FLS, little data is available regarding Rap1 function in these cells. Recently, an initial study has identified a potential role for cAMP-dependent activation of Rap1 by prostaglandin E2 in RA FLS [107 Kojima F, Kapoor M, Kawai S, Yang L, Aronoff DM, Crofford LJ. Prostaglandin E2 activates Rap1 via EP2/EP4 receptors and cAMPsignaling in rheumatoid synovial fibroblasts: involvement of Epac1 and PKA Prostaglandins Other Lipid Mediat 2009; 89: 26-33.]. However, the physiological consequences of Rap1 activation in RA FLS remain to be identified. Rho family GTPases are best known for their role as key regulators in coupling extracellular stimuli to maintenance and reorganization of cytoskeletal structure, as well as cell-cycle progression, and MAP kinase-dependent gene expression [108 Jaffe AB, Hall A. Rho GTPases: Biochemistry and biology Annu Rev Cell Dev Biol 2005; 21: 247-69.]. The mammalian Rho family is comprised of 20 members, four of which, Rac1, Rac2, RhoA and Cdc42, have been best characterized. Rho GTPases have been shown to control cellular motility and polarity in migrating cells by regulating actin and myosin organization. In this context, Rac1 is often associated with lamellipodium formation and membrane ruffling, as well as regulation of the oxidative burst, Cdc42 with actin microspike and filopodium formation, and RhoA with the promotion of actin stress fiber formation and focal adhesion assembly [108 Jaffe AB, Hall A. Rho GTPases: Biochemistry and biology Annu Rev Cell Dev Biol 2005; 21: 247-69.]. Rho family GTPases also often play a more prominent role in the activation of serine/threonine kinases leading to p38 and JNK activation than Ras GTPases [109 Dhillon AS, Hagan S, Rath O, Kolch W. MAP kinase signalling pathways in cancer Oncogene 2007; 26: 3279-90.]. Human Rho family GTPases are regulated by a bewildering array of GEFs and GAPs. Some 70 Rho family GEFs are comprised of two families of proteins, the Dbl homology (DH) family, and DOCK family, which can be activated by receptor tyrosine kinases (or receptor-associated tyrosine kinases), G-coupled protein receptors, integrins and other receptors [110 Schiller MR. Coupling receptor tyrosine kinases to Rho GTPases-- GEFs what's the link Cell Signal 2006; 18: 1834-43., 111 Aittaleb M, Boguth CA, Tesmer JJ. Structure and function of heterotrimeric G protein-regulated Rho guanine nucleotide exchange factors Mol Pharmacol 2010; 77: 111-25.]. Genome sequencing has indicated that up to 70 different RhoGAPs may be expressed in humans, only a handful of which have been well-characterized [112 Tcherkezian J, Lamarche-Vane N. Current knowledge of the large RhoGAP family of proteins Biol Cell 2007; 99: 67-86.]. Bound to GTP, Rho family GTPases can interact with a large number of effector proteins including not only those that directly regulate cytoskeletal rearrangements, but also couple to PI 3-kinase, MAP kinase, and NF-êB signaling pathways [108 Jaffe AB, Hall A. Rho GTPases: Biochemistry and biology Annu Rev Cell Dev Biol 2005; 21: 247-69.]. A number of mice deficient in the expression of Rho family members, such as Rac1, Rac2, Cdc42, and RhoH have been generated, and each displays immune phenotypes [113 Mulloy JC, Cancelas JA, Filippi MD, Kalfa TA, Guo F, Zheng Y. Rho GTPases in hematopoiesis and hemopathies Blood 2010; 115: 936-47.]. Complete deletion of Rac1 results in embryonic lethality, but use of targeted deletion strategies has revealed that many cellular functions of Rac1 in the immune system are redundantly regulated by Rac2 [113 Mulloy JC, Cancelas JA, Filippi MD, Kalfa TA, Guo F, Zheng Y. Rho GTPases in hematopoiesis and hemopathies Blood 2010; 115: 936-47., 114 Sugihara K, Nakatsuji N, Nakamura K, et al. Rac1 is required for the formation of three germ layers during gastrulation Oncogene 1998; 17: 3427-3.]. Deletion of either Rac1 or Rac2 alone has no impact on T cell development, but simultaneous deletion of both GTPases blocks early thymocyte development, prior to mature TCR expression, as well as positive selection [115 Croker BA, Handman E, Hayball JD, et al. Rac2-deficient mice display perturbed T-cell distribution and chemotaxis, but only minor abnormalities in T(H)1 responses Immunol Cell Biol 2002; 80: 231-40.-118 Dumont C, Corsoni-Tadrzak A, Ruf S, et al. Rac GTPases play critical roles in early T-cell development Blood 2009; 113: 3990-8.]. In mature T cells, Rac2 is required for chemotactic responses in vitro and in vivo, and may contribute to TCR-dependent proliferative responses, Th1 maturation and IFNγ production, although this requirement is not strong enough to affect Th1-dependent responses to infection [115 Croker BA, Handman E, Hayball JD, et al. Rac2-deficient mice display perturbed T-cell distribution and chemotaxis, but only minor abnormalities in T(H)1 responses Immunol Cell Biol 2002; 80: 231-40., 116 Yu H, Leitenberg D, Li B, Flavell RA. Deficiency of small GTPase Rac2 affects T cell activation J Exp Med 2001; 194: 915-26., 119 Li B, Yu H, Zheng W, et al. Role of the guanosine triphosphatase Rac2 in T helper 1 cell differentiation Science 2000; 288: 2219-.]. In B cells, Rac1, together with Rac2, plays an important role in BCR-induced activation, transducing BCR signals that control survival and cell cycle entry [120 Walmsley MJ, Ooi SKT, Reynolds LF, et al. Critical roles for Rac1 and Rac2 GTPases in B cell development and signaling Science 2003; 302: 459-62., 121 Croker BA, Tarlinton DM, Cluse LA, et al. The Rac2 guanosine triphosphatase regulates B lymphocyte antigen receptor responses and chemotaxis and is required for establishment of B-1a and marginal zone B lymphocytes J Immunol 2002; 168: 3376-86.]. Unique roles for Rac1 and Rac2 appear in myeloid lineage cells. Deletion of either Rac1 or Rac2 in neutrophils decreases chemotactic responses in vitro and in vivo, but only Rac2 is required for NADPH oxidase function [122 Glogauer M, Marchal CC, Zhu F, et al. Rac1 deletion in mouse neutrophils has selective effects on neutrophil functions J Immunol 2003; 170: 5652-7.]. Further analyses have demonstrated that Rac1 regulates neutrophil polarization toward chemotactic agents, while Rac2 is responsible for motoric migration towards the chemoattractant [123 Sun CX, Downey GP, Zhu F, Koh AL, Thang H, Glogauer M. Rac1 is the small GTPase responsible for regulating the neutrophil chemotaxis compass Blood 2004; 104: 3758-65.]. Rac1 is required for macrophage cell spreading and membrane ruffling, but neither Rac1 nor Rac2 appear to be required for efficient macrophage migration [124 Wells CM, Walmsley M, Ooi S, Tybulewicz V, Ridley AJ. Rac1- deficient macrophages exhibit defects in cell spreading and membrane ruffling but not migration J Cell Sci 2004; 117: 1259-68., 125 Wheeler AP, Wells CM, Smith SD, et al. Rac1 and Rac2 regulate macrophage morphology but are not essential for migration J Cell Sci 2006; 119: 2749-57.]. A specific required role for Rac2 has been demonstrated in macrophage oxidative bursts and Fcγ receptor-mediated phagocytosis [126 Yamauchi A, Kim C, Li S, et al. Rac2-deficient murine macrophages have selective defects in superoxide production and phagocytosis of opsonized particles J Immunol 2004; 173: 5971-9.]. Dendritic cells (DCs) lacking expression of both Rac1 and Rac2 show defective cytoskeletal rearrangements, migration, antigen presentation and formation of immunological synapses with T cells, preventing adequate T cell priming [127 Benvenuti F, Hugues S, Walmsley M, et al. Requirement of Rac1 and Rac2 expression by mature dendritic cells for T cell priming Science 2004; 305: 1150-3.]. Finally, in osteoclastogenesis, both Rac1 and Rac2 contribute to osteoclast development in vitro. Rac1 is selectively required for M-CSF-dependent migration of pre-osteoclasts and RANKL-induced superoxide bursts. These specific attributes of Rac1 signaling in osteoclastogenesis are also evident in vivo, as mice in which Rac1 is conditionally deleted in myeloid lineage cells, but not Rac2-deficient mice, show increased trabecular bone volume [128 Wang Y, Lebowitz D, Sun C, Thang H, Grynpas MD, Glogauer M. Identifying the relative contributions of Rac1 and Rac2 to osteoclastogenesis J Bone Miner Res 2008; 23: 260-70.]. Lineage-specific requirements for Rac protein signaling are also observed in mice deficient for DOCK2, a Rac-specific GEF expressed in hematopoietic cells. B and T lymphocytes and plasmacytoid DCs, but not monocytes or myeloid DCs, from DOCK2-deficient mice display defective chemotactic responses in vitro, and lymphocytes fail to home to lymphoid organs in vivo [129 Fukui Y, Hashimoto O, Sanui T, et al. Haematopoietic cell-specific CDM family protein DOCK2 is essential for lymphocyte migration Nature 2001; 412: 826-31., 130 Gotoh K, Tanaka Y, Nishikimi A, et al. Differential requirement for DOCK2 in migration of plasmacytoid dendritic cells versus myeloid dendritic cells Blood 2008; 111: 2973-6.]. Neutrophils from these mice do respond to chemoattractants, but are hampered in the speed of their response [131 Kunisaki Y, Nishikimi A, Tanaka Y, et al. DOCK2 is a Rac activator that regulates motility and polarity during neutrophil chemotaxis J Cell Biol 2006; 174: 647-52.]. Knockout mice have been generated for a number of the Rho GTPases, which have in particular revealed requirements for these proteins in regulating T cell development and function. During thymocyte development, functional Rho is required through the early pre-T cell stage for cell survival, while in late pre-T cells, Rho activity is needed for thymocyte proliferation [132 Galandrini R, Henning SW, Cantrell DA. Different functions of the GTPase Rho in prothymocytes and late pre-T cells Immunity 1997; 7: 163-74.]. Additionally, Rho activation is sufficient and necessary for thymocyte integrin-dependent adhesion and chemotactic responses [133 Vielkind S, Gallagher-Gambarelli M, Gomez M, Hinton HJ, Cantrell DA. Integrin regulation by RhoA in thymocytes J Immunol 2005; 175: 350-7.]. In mature cytotoxic T cells and natural killer cells, each of the components of the RhoA/Rho kinase (ROCK)/LIM-kinase pathway is required for cytoskeletal arrangements critical for cell-mediated killing [134 Lou Z, Billadeau DD, Savoy DN, Schoon RA, Leibson PJ. A role for a RhoA/ROCK/LIM-kinase pathway in the regulation of cytotoxic lymphocytes J Immunol 2001; 167: 5749-.]. Roles for both RhoA and RhoB have been identified in MHC II surface expression and antigen-dependent activation of T cells by DCs [135 Kamon H, Kawabe T, Kitamura H, et al. TRIF-GEFH1-RhoB pathway is involved in MHCII expression on dendritic cells that is critical for CD4 T-cell activation EMBO J 2006; 25: 4108-19., 136 Ocana-Morgner C, Wahren C, Jessberger R. SWAP-70 regulates RhoA/RhoB-dependent MHCII surface localization in dendritic cells Blood 2009; 113: 1474-82.]. RhoH, expressed specifically in hematopoietic lineage cells, is required for proper TCR signaling in thymocytes and mature T cells but suppresses chemokine-dependent adhesion [137 Gu Y, Chae HD, Siefring JE, Jasti AC, Hildeman DA, Williams DA. RhoH GTPase recruits and activates Zap70 required for T cell receptor signaling and thymocyte development Nat Immunol 2006; 7: 1182-90.-139 Baker CM, Comrie WA, Hyun YM, et al. Opposing roles for RhoH GTPase during T-cell migration and activation Proc Natl Acad Sci USA 2012; 109(26 ): 10474-9.]. However, Rho function is not restricted to T lymphocytes, as mast cells from RhoH-deficient mice display defects in degranulation and cytokine production [140 Oda H, Fujimoto M, Patrick MS, et al. RhoH plays critical roles in Fc epsilon RI-dependent signal transduction in mast cells J Immunol 2009; 182: 957-62.]. Deletion of Cdc42 signaling components in vivo has also demonstrated specific roles for this GTPase in immune development and responses. Mice lacking Cdc42GAP display elevated levels of Cdc42-GTP in bone marrow-derived neutrophils [141 Szczur K, Xu H, Atkinson S, Zheng Y, Filippi MD. Rho GTPase CDC42 regulates directionality and random movement via distinct MAPK pathways in neutrophils Blood 2006; 108: 4205-13.]. In vitro, random movement of these neutrophils is enhanced, while directed movement in response to fMLP is reduced. In the presence of integrin ligand and fMLP, enhanced Cdc42 activity promotes ERK activation while suppressing p38 MAP kinase activation, and the effects of Cdc42 activation on random and directed movement, is dependent upon Cdc42 signaling to these MAP kinases [141 Szczur K, Xu H, Atkinson S, Zheng Y, Filippi MD. Rho GTPase CDC42 regulates directionality and random movement via distinct MAPK pathways in neutrophils Blood 2006; 108: 4205-13.]. Specific deletion of Cdc42 in the B cell lineage significantly reduces development of mature B cells [142 Guo F, Velu CS, Grimes HL, Zheng Y. Rho GTPase Cdc42 is essential for B-lymphocyte development and activation Blood 2009; 114: 2909-16.]. Mature B cells which do develop in these mice produce reduced IgM, IgG1 and IgG3 and are insensitive to BAFF receptor signaling, but do show normal chemotactic responses. Requisite roles for Rho, Rac, and Cdc42 proteins in osteoclast development and activation have been well-characterized, and we refer the reader to a recent comprehensive review on this subject [143 Itzstein C, Coxon FP, Rogers MJ. The regulation of osteoclast function and bone resorption by small GTPases Small Gtpases 2011; 2: 117-30.]. As evidenced by genetic studies, Rho family proteins would be predicted to make important contributions to the recruitment and activation of many cell populations involved in initiating inflammation and bone erosion in RA. Rac1 is constitutively activated in cultured RA FLS, and exposure of RA FLS to NSC23766, a small-molecular weight inhibitor of Rac1-3, or silencing of Rac1 expression, blocks their proliferation but does not cause apoptosis [144 Chan A, Akhtar M, Brenner M, Zheng Y, Gulko PS, Symons M. The GTPase Rac regulates the proliferation and invasion of fibroblast-like synoviocytes from rheumatoid arthritis patients Mol Med 2007; 13: 297-304.]. NSC23766 also reduces RA FLS invasiveness in vitro, in large part through suppressing Rac-dependent JNK activation. Little is known about the role of Rac GTPases in animal models of arthritis. Rac2-deficient mice also lacking Rac1 in their myeloid compartment have been examined in Chlamydia-induced arthritis. Here, lack of Rac1 and Rac2 protects against clinical signs of arthritis in the early stages of disease, but exacerbates disease during the chronic stage [145 Zhang X, Glogauer M, Zhu F, Kim TH, Chiu B, Inman RD. Innate immunity and arthritis: neutrophil Rac and toll-like receptor 4 expression define outcomes in infection-triggered arthritis Arthritis Rheum 2005; 52: 1297-304.]. Due to the inability of Rac1 and Rac2 -deficient neutrophils to induce TLR4 in response to Chlamydia, initial inflammatory signaling during the acute phase of disease is tempered, while later, the lack of clearance of infection exacerbates arthritis. Rac1 has also been targeted pharmacologically in CIA, using a cell-permeable Rac1 C-terminal peptide fragment which specifically blocks signalling of Rac1 but not other Rho family GTPases [146 Abreu JR, Dontje W, Krausz S, et al. A Rac1 inhibitory peptide suppresses antibody production and paw swelling in the murine collagen-induced arthritis model of rheumatoid arthritis Arthritis Res Ther 2010; 12: R2.]. In a prophylactic model of CIA, Rac1 inhibitory peptide has no effect on disease incidence, disease severity, synovial infiltration by inflammatory cells, cartilage erosion, or bone destruction. Significant decreases in paw swelling are observed, possibly due to the ability of Rac1 inhibitory peptide to prevent disruption of endothelial vascular integrity and subsequent edema. Anti-collagen antibody levels were also depressed in treated mice, consistent with the ability of Rac1 inhibitory peptide to suppress TCR/CD28 –induced TNFα, IFNγ, IL-17, ICOS and CD154 expression, gene products needed for follicular T cells to provide B cell help, in T cells from collagen-primed mice [146 Abreu JR, Dontje W, Krausz S, et al. A Rac1 inhibitory peptide suppresses antibody production and paw swelling in the murine collagen-induced arthritis model of rheumatoid arthritis Arthritis Res Ther 2010; 12: R2.]. Much of our understanding as to how Rho family GTPases might contribute to pathology in RA stems from the finding that statins, hydroxymethylglutaryl-coenzyme A (HMG-CoA) inhibitors interfere with small GTPase function by depleting farnesyl pyrophosphate and geranylgeranyl pyrophosphate intermediates needed for localization and function of Ras and Rho family members, as well as G-coupled protein receptors and other signaling proteins [147 Abeles AM, Pillinger MH. Statins as antiinflammatory and immunomodulatory agents: a future in rheumatologic therapy? Arthritis Rheum 2006; 54: 393-407.]. In RA FLS, lipophilic statins (including simvastatin, fluvastain, pitavastatin, and cerivastatin) but not hydrophilic statins (such as atorvastatin) reduce proliferation and induce apoptosis, associated with inactivation of Rac1 and RhoA [148 Connor AM, Berger S, Narendran A, Keystone EC. Inhibition of protein geranylgeranylation induces apoptosis in synovial fibroblasts Arthritis Res Ther 2006; 8: R94.-150 Xu H, Liu P, Liang L, et al. RhoA-mediated, tumor necrosis factor alpha-induced activation of NF-kappaB in rheumatoid synoviocytes: inhibitory effect of simvastatin Arthritis Rheum 2006; 54: 3441-51.]. Simvastatin reduces membrane localization of both Rac1 and RhoA, and enhances both basal and TNFα-induced apoptosis, possibly due to decreased PKB activity [148 Connor AM, Berger S, Narendran A, Keystone EC. Inhibition of protein geranylgeranylation induces apoptosis in synovial fibroblasts Arthritis Res Ther 2006; 8: R94.]. Although the apoptotic PKB inhibitory effect of statins can be in part mimicked by silencing of Rac1, a more robust phenocopy is observed in RA FLS treated with an inhibitor of ROCK, a downstream effector of RhoA, or cell-permeable inhibitory peptides targeting RhoA [148 Connor AM, Berger S, Narendran A, Keystone EC. Inhibition of protein geranylgeranylation induces apoptosis in synovial fibroblasts Arthritis Res Ther 2006; 8: R94., 149 Nagashima T, Okazaki H, Yudoh K, Matsuno H, Minota S. Apoptosis of rheumatoid synovial cells by statins through the blocking of protein geranylgeranylation: a potential therapeutic approach to rheumatoid arthritis Arthritis Rheum 2006; 54: 579-86., 151 Nakayamada S, Kurose H, Saito K, Mogami A, Tanaka Y. Small GTP-binding protein Rho-mediated signaling promotes proliferation of rheumatoid synovial fibroblasts Arthritis Res Ther 2005; 7: R476-84.]. Complementary use of RA FLS transfected with dominant-negative RhoA also demonstrates that RhoA is responsible for simvastatin interference with TNFα-induced NF-κB activation and IL-6 production [150 Xu H, Liu P, Liang L, et al. RhoA-mediated, tumor necrosis factor alpha-induced activation of NF-kappaB in rheumatoid synoviocytes: inhibitory effect of simvastatin Arthritis Rheum 2006; 54: 3441-51.]. Similar RhoA-dependent effects of simvastatin are observed with TLR2-stimulated peripheral blood monocytes from RA patients [152 Lin H, Xiao Y, Chen G, et al. HMG-CoA reductase inhibitor simvastatin suppresses Toll-like receptor 2 ligand-induced activation of nuclear factor kappa B by preventing RhoA activation in monocytes from rheumatoid arthritis patients Rheumatol Int 2011; 31(11 ): 1451-8.]. As in the case of Rac, few studies are available examining the effect of Rho inhibition in animal models of arthritis, but ROCK inhibitors reduce pain in rat models of arthritis [153 He Y, Xu H, Liang L, et al. Antiinflammatory effect of Rho kinase blockade via inhibition of NF-kappaB activation in rheumatoid arthritis Arthritis Rheum 2008; 58: 3366-76.]. Additionally, some studies have reported beneficial effects of statins in the treatment of murine CIA, although independent studies have failed to reproduce these results [154 Leung BP, Sattar N, Crilly A, et al. A novel anti-inflammatory role for simvastatin in inflammatory arthritis J Immunol 2003; 170: 1524-30., 155 Palmer G, Chobaz V, Talabot-Ayer D, et al. Assessment of the efficacy of different statins in murine collagen-induced arthritis Arthritis Rheum 2004; 50: 4051-9.]. Rho family signaling may also be important in SLE. In macrophages isolated from mice with spontaneous SLE-like disease, including MRL/lpr and New Zealand Black/White F1 (NZBWF1) mice, serum-dependent activation of RhoA, but not Rac, Cdc42 or Ras proteins is suppressed [156 Fan H, Patel VA, Longacre A, Levine JS. Abnormal regulation of the cytoskeletal regulator Rho typifies macrophages of the major murine models of spontaneous autoimmunity J Leukoc Biol 2006; 79: 155-65.]. The genetic or molecular mechanism underlying this is currently unknown, and similar studies on SLE patient macrophages have yet to be reported. No studies are currently available in which Rho family GTPases were specifically targeted in animal models of SLE, but treatment of NZBWF1 mice with the statin atorvastatin decreases spontaneous lupus-like pathology, including diminuation of serum and glomerular auto-antibody levels [157 Lawman S, Mauri C, Jury EC, Cook HT, Ehrenstein MR. Atorvastatin inhibits autoreactive B cell activation and delays lupus development in New Zealand black/white F1 mice J Immunol 2004; 173: 7641-6.]. 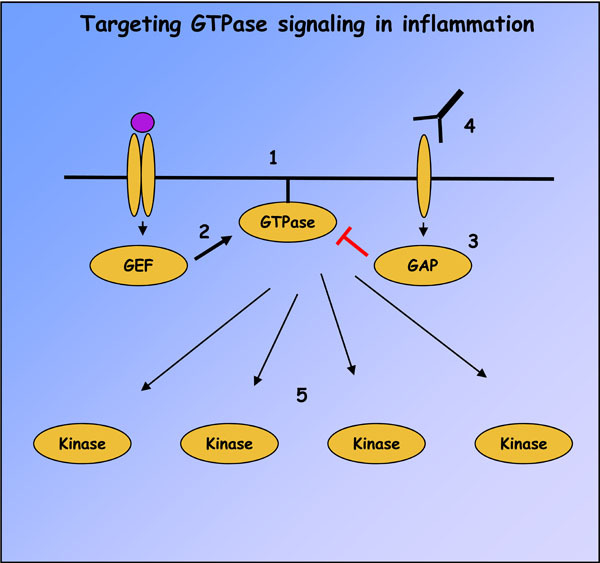 As our understanding of the genetics, epigenetics, and biochemical signal cascades imprinting and driving the chronic inflammatory state in RA and other inflammatory diseases accelerates, it is clear that altered signaling of small GTPases contributes to the “semi-transformed” phenotype of inflamed tissue. However, much work remains to be done, in both understanding how specific GTPase signaling pathways contribute to disease, and identifying selective therapeutic strategies for modifying their function. We still lack a detailed overview of the local expression patterns of GTPase regulatory proteins at the site of inflammation of RA and other inflammatory diseases, and exceedingly few mice lacking small GTPases or their regulatory proteins have been examined in animal models of diseases. Such efforts are warranted by initial findings that inhibition of Rho signaling pathways, or activation of T cell Rap1 signaling, is protective in animal models of multiple sclerosis [158 Salinas GF, Krausz S, Dontje W, et al. Sustained Rap1 activation in autoantigen-specific T lymphocytes attenuates experimental autoimmune encephalomyelitis J Neuroimmunol 2012. [Epub ahead of print]-161 Walters CE, Pryce G, Hankey DJ, et al. Inhibition of Rho GTPases with protein prenyltransferase inhibitors prevents leukocyte recruitment to the central nervous system and attenuates clinical signs of disease in an animal model of multiple sclerosis J Immunol 2002; 168: 4087-94.]. Another area requiring attention is that, in cases where genetically modified mice show altered adaptive immune phenotypes, it will be important to distinguish whether the phenotype arises from changes in lymphocyte function relevant to the human disease in question, or from changes in shaping of the antigen receptor repertoire during development [162 Cope AP, Londei M, Chu NR, et al. Chronic exposure to tumor necrosis factor (TNF) in vitro impairs the activation of T cells through the T cell receptor/CD3 complex, reversal in vivo by anti- TNF antibodies in patients with rheumatoid arthritis J Clin Invest 1994; 94: 749-60.-164 Abreu JR, Grabiec AM, Krausz S, et al. The presumed hyporesponsive behavior of rheumatoid arthritis T lymphocytes can be attributed to spontaneous ex vivo apoptosis rather than defects in T cell receptor signaling J Immunol 2009; 183: 621-30.]. An increasingly detailed understanding of how GEFs and GAPs are regulated and interact with their GTPase targets is providing new opportunities for therapeutic development (Fig. 3 ) [22 Bos JL, Rehmann H, Wittinghofer A. GEFs and GAPs: critical elements in the control of small G proteins Cell 2007; 129: 865-77.]. To date there has been little attempt to directly target individual small GTPases either by interfering with their ability to bind to GTP, or by accelerating their instrinsic GTPases activity [22 Bos JL, Rehmann H, Wittinghofer A. GEFs and GAPs: critical elements in the control of small G proteins Cell 2007; 129: 865-77.]. Some effort has been placed in exploring the possibilities of interfering with GTPase function using compounds which cause their mislocalization within the cell. However, in limited clinical trials, statins have demonstrated at best limited efficacy in the treatment of RA [147 Abeles AM, Pillinger MH. Statins as antiinflammatory and immunomodulatory agents: a future in rheumatologic therapy? Arthritis Rheum 2006; 54: 393-407.]. This may be because statins interfere with both the farnesylation and geranylgeranylation of Ras and Rho family GTPases. At least in RA FLS, these two families of small GTPases appear to antagonize each in terms of FLS MMP-1 production, leading to a neutral effect of statins on cellular activation [56 Abeles AM, Marjanovic N, Park J, et al. Protein isoprenylation regulates secretion of matrix metalloproteinase 1 from rheumatoid synovial fibroblasts: effects of statins and farnesyl and geranylgeranyl transferase inhibitors Arthritis Rheum 2007; 56: 2840-53.]. FTIs are used in the treatment of cancer, while gerangeranyl transferase inhibitors are too toxic for use in animal models of arthritis [147 Abeles AM, Pillinger MH. Statins as antiinflammatory and immunomodulatory agents: a future in rheumatologic therapy? Arthritis Rheum 2006; 54: 393-407.]. The major caveat in further exploration of FTIs is that they will indiscriminately interfere with the function of not only Ras proteins, but also a subset of Rho family members and G-coupled protein receptors [55 Philips MR, Cox AD. Geranylgeranyltransferase I as a target for anti-cancer drugs J Clin Invest 2007; 117: 1223-5.]. More specificity might be obtained using cell-permeable GTPase inhibitory fragments, but these compounds are cleared very quickly and are relatively unstable in vivo, limiting their efficacy. One promising avenue of approach is the design of small compounds which specifically activate or inhibit GEFs and GAPs via interaction with allosteric regulatory domains or their catalytic sites. One example of the former is a cAMP-analog which specifically activates the Rap1 GEF EPAC, but not protein kinase A [165 Enserink JM, Christensen AE, de RJ, et al. A novel Epac-specific cAMP analogue demonstrates independent regulation of Rap1 and ERK Nat Cell Biol 2002; 4: 901-6.]. The generation of a series of inhibitors blocking DOCK2 catalytic activity provides proof-of-principal evidence that specific GEF activity can be targeted [129 Fukui Y, Hashimoto O, Sanui T, et al. Haematopoietic cell-specific CDM family protein DOCK2 is essential for lymphocyte migration Nature 2001; 412: 826-31.-131 Kunisaki Y, Nishikimi A, Tanaka Y, et al. DOCK2 is a Rac activator that regulates motility and polarity during neutrophil chemotaxis J Cell Biol 2006; 174: 647-52., 166 Nishikimi A, Uruno T, Duan X, et al. Blockade of Inflammatory Responses by a Small-Molecule Inhibitor of the Rac Activator DOCK2 Chem Biol 2012; 19: 488-97.]. Detailed structural analyses of small GTPases with their regulatory proteins and effectors is also allowing the development of biphasic aptamer compounds which block the interface of protein-protein interactions. Two such compounds have recently been identified, based on either chemical-genetic approaches, or chemical-based virtual screening technologies, which selectively interfere with activation of Rho GTPases by the GEF Trio [167 Schmidt S, Diriong S, Mery J, Fabbrizio E, Debant A. Identification of the first Rho-GEF inhibitor, TRIPalpha, which targets the RhoA-specific GEF domain of Trio FEBS Lett 2002; 523: 35-42., 168 Gao Y, Dickerson JB, Guo F, Zheng J, Zheng Y. Rational design and characterization of a Rac GTPase-specific small molecule inhibitor Proc Natl Acad Sci USA 2004; 101: 7618-23.]. As detailed elsewhere in this journal series, signaling enzymes downstream of small GTPases, such as PI3-K, MAP kinases, and ROCK represent exciting targets for pharamacological intervention in IMIDs. Lastly, antibody strategies aimed at agonizing or antagonizing cell surface proteins coupled to the regulation of GEFs and GAPs is an area which has not been fully explored. Unintentionally, the clinical success of Abatacept (CTLA4-Ig) in the treatment of RA may already suggest the power of this technique, as one of the proximal effects of CTLA4-Ig on synovial T cells is the restoration of Rap1 signaling, an effect likely mediated by CD28 and CTLA4 functional interactions with RapGAPI [91 Dillon TJ, Carey KD, Wetzel SA, Parker DC, Stork PJ. Regulation of the small GTPase Rap1 and extracellular signal-regulated kinases by the costimulatory molecule CTLA-4 Mol Cell Biol 2005; 25: 4117-28., 98 Remans PH, Wijbrandts CA, Sanders ME, et al. CTLA-4IG suppresses reactive oxygen species by preventing synovial adherent cell-induced inactivation of Rap1, a Ras family GTPASE mediator of oxidative stress in rheumatoid arthritis T cells Arthritis Rheum 2006; 54: 3135-43.]. Time and effort will tell if biologicals represent an effective strategy for specifically interfering with the complexities and redundancies of small GTPases in chronic inflammatory diseases.